The broadcasters behind Freeview have called for safeguards to be built into plans that are being drawn up ahead of a planned Europe-wide clearance of TV frequencies for mobile broadband usage. Digital UK, which is owned by the BBC, ITV, Channel 4 and Arqiva, and manages digital terrestrial TV in the UK, has said it fears up to 100,000 households may need a new aerial and some areas face a risk of "less reliable coverage" as a result of the clearance, which will remove services broadcasting in the 700MHz frequency band. The claim forms part of Digital UK's response to a recent European Commission public consultation on the future of the UHF frequency band, which has been traditionally used to broadcast TV signals to households via an aerial. It says it doesn't want viewers to have to bear the cost of the changes and that broadcasters and multiplex operators should be compensated for the costs that will be incurred. Digital UK says it wants safeguards in place to ensure the proposed Europe-wide clearance isn't a "staging post" with more and more frequencies taken away from TV broadcasters over time, with clarity over the future, so that investment decisions affecting digital terrestrial TV can be made. It, along with the European Broadcasting Union (EBU), which also responded to the consultation, wants the remaining TV frequencies safeguarded for free-to-air TV until 2030. With TV broadcasts needing to squeeze into less space, the European Commission wanted to hear opinions on newer technological standards that make more efficient use of bandwidth, such as DVB-T2. DVB-T2, the broadcast standard used for Freeview HD in the UK is being rolled out as the sole terrestrial broadcast standard in Austria and Germany. But Digital UK said it failed to see the benefits of mandating a UK switch to all DVB-T2 broadcasts. A complete switch to DVB-T2 would make older Freeview boxes and TVs useless. Confirming that another digital multiplex broadcasting using the DVB-T2 standard is "likely to launch" this year, Digital UK says it would welcome "policy support for additional measures to accelerate take up which would deliver significant benefits in terms of spectrum efficiency and channel choice." 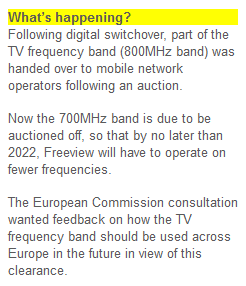 Digital UK and the EBU pointed out that some European countries would struggle to clear the 700MHz band by 2022 and requested that the European Commission be flexible in setting a clearance deadline. The Commission is now analysing the responses it has received from across Europe ahead of this year's WRC-15 conference when decisions will be made. The responses will help form the EU's stance on the proposed changes. 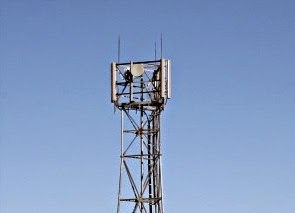 The 700MHz band has already been cleared of TV broadcasts in most other parts of the world. Somebody needs a head test in this country. Yesterday I read that some twit from the BBC expects to transmit 4K signals as standard from next year and here you have Digital UK effectively saying DVB-T2 is useless. When they can actually decide what platform they're going to use in the future maybe they can buy me a suitable receiver! 4k would likely be internet and satellite based. Digital UK don't want a mandatory DVB-T2 switch as stated above, but they do want to encourage take up, with another DVB-T2 multiplex preparing to launch.